You can navigate a web map faster in Event Editor using bookmarks. 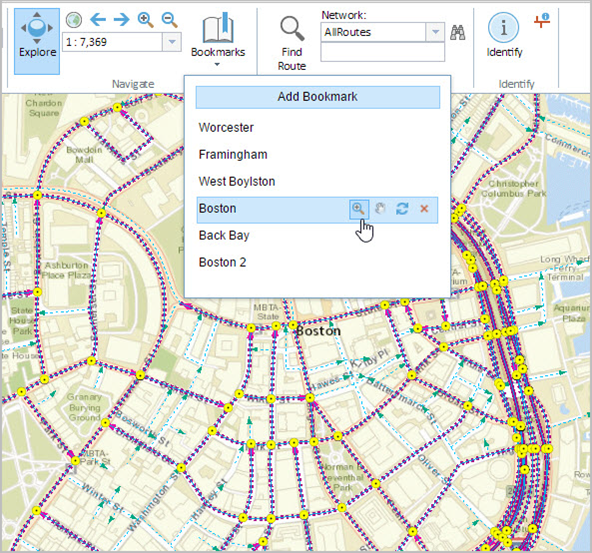 You can create or edit existing bookmarks to access a specific location in a web map. When Portal for ArcGIS or ArcGIS Online security is deployed, bookmarks can be loaded from an existing web map as well as saved to a new or existing web map. The Bookmarks button shows a drop-down menu of existing bookmarks and allows you to create new bookmarks. In the Navigate section, click the Bookmarks button . You can add a new bookmark to save the location of a map for future reference. Browse to the location in the map where you want your new bookmark. In the Navigate section, click the Bookmarks button and click Add Bookmark. Type the name in the Name text box and click Enter. The following additional functionality is available. To pan and zoom to a saved location, click the Bookmarks button and click an existing bookmark. To rename a bookmark, double-click the bookmark and type the new name. To reorder a bookmark, drag the bookmark to a new location in the list. Click the Zoom to Extent button to zoom into an area of the bookmark. To pan, click the Pan to Extent button , and the view changes to that saved location. The map pans to the saved location but does not change to the bookmark's scale if it is different from that of the current map. To replace the saved location with the current extent and scale on the map, click the Update Bookmark button . To delete the bookmark, click the Delete Bookmark button at the end of the row.